Since my freshman year of college, I've had (and still have) the greatest group of 11 friends known to mankind. You're probably thinking, LOL "no, I do...", But I beg to differ. Towards the end of our freshman year, 8 of us signed a lease for a gorgeous 3-story Victorian home that wouldn't be ours until junior year. Well worth the wait considering we planted ourselves in that bad boy until we graduated even after destroying it worse than a bunch of degenerate frat boys would. Our living room, which in any house is "the spot", had this heinous baby blue and brown Victorian paisley wallpaper. The worst part is that even the molding was baby blue, so any decoration we thought about putting up on the walls would probably make a blind person dizzy. We all had our own humongous stack of photos with all of us in it that went back all the way to freshman year. 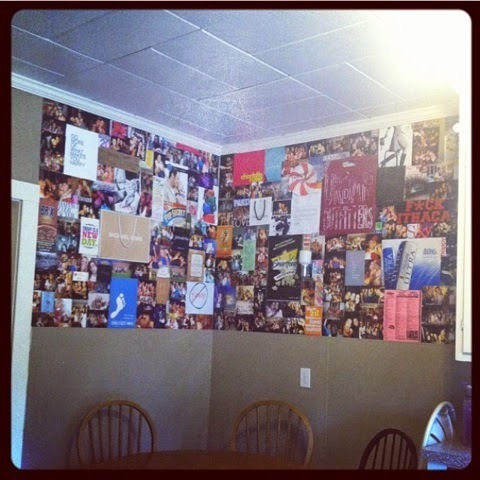 They were probably left over from decorating our rooms and realistically just collecting dust, so I had this bright idea of covering the top half of the entire kitchen wall with pictures of us. We put all of our photos together and eliminated the irrelevant ones, cut out fun stuff from magazines, cleaned out our junk drawers, checked our garbage, and searched for as many unique fillers as possible for the wall. Yes, we had white cheddar popcorn bags, shoe box covers, shopping totes, take-out menus, cardboard beer cases, violation tickets, and old t-shirts... I never said we weren't a bunch of degenerates ourselves. It might have taken 3 days to complete, but I present you with our work of art. Everything on that wall told a story and had our guests staring for hours.